The red fruits found in a pomegranate are extremely powerful antioxidants and represent a highly effective ally for women with sensitive skin. When incorporated in the proper cosmetic treatment, the properties found in this surprising fruit, act from the inside out, to aid damaged skin. Repair occurs thanks to the characteristics of the pomegranate, which include stimulating the regeneration of skin cells. The name pomegranate derives from medieval Latin pōmum “apple” and grānātum “seeded”. Originally from the ancient Persian empire, which included present-day Greece, Turkey, Iran and Iraq, it is still mainly cultivated in the Mediterranean region, the Middle East and India. 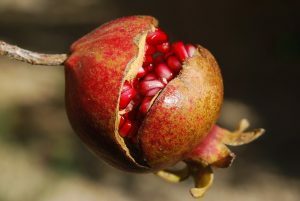 Since ancient times, the pomegranate has been considered a symbol of beauty, fertility, sensuality and strength. In recent times the value of pomegranate fruit has been rediscovered for culinary purposes and for new cosmetics. In Ancient Greek mythology, the pomegranate was known as the “fruit of the dead” and believed to have sprung from the blood of Adonis. The myth of Persephone, the goddess of the underworld, prominently features the pomegranate. In one version of the myth, Persephone was kidnapped by Hades and taken off to live in the underworld as his wife. Her mother, Demeter (goddess of the harvest), went into mourning for her lost daughter; thus all green things ceased to grow. Zeus, the highest-ranking of the Greek gods, could not allow the Earth to die, so he commanded Hades to return Persephone. It was the rule of the Fates that anyone who consumed food or drink in the underworld was doomed to spend eternity there. Persephone had no food, but Hades offered her a pomegranate and she ate six seeds, so from then on had to spend six months in the underworld every year. During these six months, while Persephone sits on the throne of the underworld beside her husband Hades, her mother Demeter mourns and no longer gives fertility to the earth. This was an ancient Greek explanation for the seasons. The precious oil extracted from pomegranate seeds has antioxidant and regenerating properties due to its high content of polyphenols. These natural chemicals exert a cleansing action against free radicals, responsible for the premature aging of skin and cells. Pomegranate seed oil revitalizes skin cells by firming and smoothing the skin naturally. The pomegranate seed oil stabilizes and relaxes the skin during periods of transition, and is especially effective during the change of seasons. Rich in vitamins and antioxidants that counteract free radicals, pomegranate juice is a valuable ally for skin care. Pomegranate juice is strongly recommended to counter dry, chapped and irritated skin because it contains punicic acid and omega-5 fatty acids, which moisturize the skin and prevent fluid loss. It also counteracts the opposite problem, namely acne and oily skin, as it is rich in vitamin C, which regulates the production of sebum, an oily substance secreted by the skin that is the primary cause of pimples. The polyphenols contained in the pomegranate also help fight skin problems such as eczema and psoriasis and do not leave scars after healing. Use the seeds of pomegranate fruits to create a revitalizing DIY scrub. Just chop the seeds and add them to sugar or sea salt. Use sugar if you want to create a more delicate scrub that is also suitable for the face (since the sugar granules are very small and therefore less aggressive). Using sea salt (due to the larger size of the granules) will instead produce a more energetic exfoliant suitable for areas of the body that are not too delicate. Once you have chosen the type of scrub you wish to create, add the pomegranate seeds and sugar to olive oil, mix the ingredients, and gently massage it all over the body to eliminate dead cells and, at the same time, nourish the skin. After exfoliation, rinse thoroughly with warm water. Choosing an organic approach to living a healthier lifestyle may be applied to many aspects of self-care.